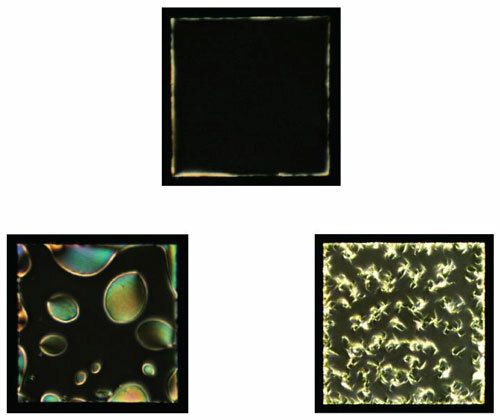 (Nanowerk News) Liquid crystals are familiar to most of us as the somewhat humdrum stuff used to make computer displays and TVs. Even for scientists, it has not been easy to find other ways of using them. Now a group of researchers at the University of Chicago's Institute for Molecular Engineering (IME) is putting liquid crystals to work in a completely unexpected realm: as detectors for the protein fibers implicated in the development of neuro-degenerative diseases such as Alzheimer's. Their novel approach promises an easier, less costly way to detect these fibers and to do so at a much earlier stage of their formation than has been possible before -- the stage when they are thought to be the most toxic. The work of de Pablo's team was published online Sept. 9, 2015, by the journal Advanced Functional Materials ("Liquid Crystal Enabled Early Stage Detection of Beta Amyloid Formation on Lipid Monolayers"). Co-authoring the article were IME scientists Monirosadat Sadati, Julio Armas-Perez, Jose Martinez-Gonzalez, and Juan Hernandez-Ortiz, as well as Aslin Izmitli-Apik and Nicholas Abbott of the University of Wisconsin at Madison. "For research in type II diabetes or Alzheimer's or Parkinson's, having this simple platform to perform these tests at a fraction of the cost of what's required for fluorescence or neutron scattering would be very useful."